Containerization is the technique breathing life into DevOps; this how-to will get you started in minutes with Red Hat's version of a Container Developer Kit. 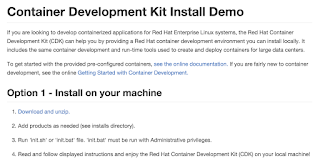 Last month we put together a demo project to get you up and running with the Red Hat Container Development Kit (CDK). 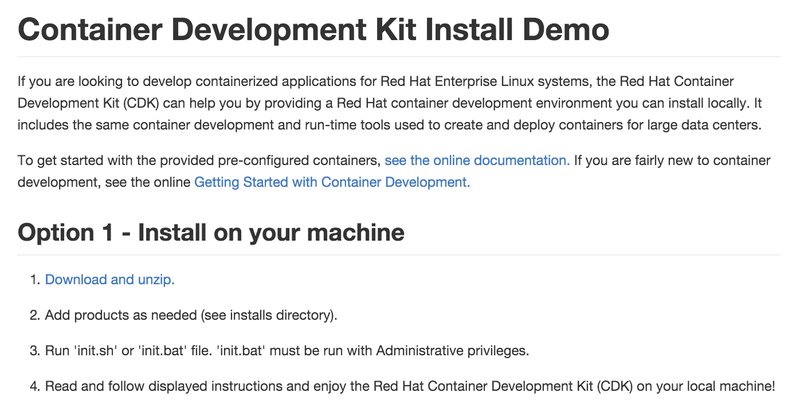 As an application developer or architect tasked with exploring the possibilities that containerized applications offer, Red Hat provides a Container Development Kit (CDK) that has all the tooling you need for your local OSX, Linux or Windows environment. It also has a few containers pre-configured for you to explore. Last week this project released version 2.0, so we updated the automated installation project called the Container Development Kit Install Demo. 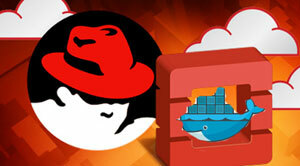 This article will get you started in just minutes with the entire Red Hat CDK installed locally on your personal machine. First off, the Red Hat CDK is a product that is available to customers and partners, for more details on who has access and how to obtain access, see Red Hat Developers. Also for the details around what specifications for your machine, see the online documentation. The Red Hat CDK is packaged into a RHEL 7 virtual machine that you can start on your machine after installing this project. There are several choices provided with pre-configured installations, but they all include the basic setup for Docker and the tools needed to start leveraging Docker based containers. OpenShift Enterprise - a containerized version of OpenShift Enterprise can be started that can be accesses through a Web console in your browser or via the OpenShift command line tools. Explore your very own private PaaS developer experience with this container. Kubernetes - a container to set you up for exploring a Kubernetes cluster. It is setup to run as an all-in-one Kubernetes master to manage pods and node for running multiple pods. On top of this you can start creating your own container based applications after you are comfortable with how these examples work. As you might not want to go through all the steps in the installation guide time and again to setup the Red Hat CDK on your machine, here I hope to make it so simple anyone can do it. Not only that, you can do it in just four steps, I promise! It is really that easy with the fully automated Container Development Kit Install Demo project put together to make the process both fool proof and repeatable. So what are the three steps you ask? It will check if you have the pre-requisites installed, but if you don't and start the installation it will stop, warn you and provide the links to go and get what is missing. The same goes for the products needed, which depend on your OS for the correct virtual image you need to run the Red Hat CDK, don't worry, it will point you in the right direction if you read the output. For more information around containers, a Cloud stack and why you need to care about this containerized stack for your application development, see the App Dev Cloud Stack series that takes you on a tour of the Red Hat Cloud Suite. We will be back soon to dive deeper into how these container examples in the Red Hat CDK look and how to get started with them. Published at DZone with permission of Eric D. Schabell , DZone MVB. See the original article here.